No, you are not stupid! Ok, all three are delivering "normal" enclosures as well. You don't need to send them an existing enclosure. But you are talking about somenthing like this or? 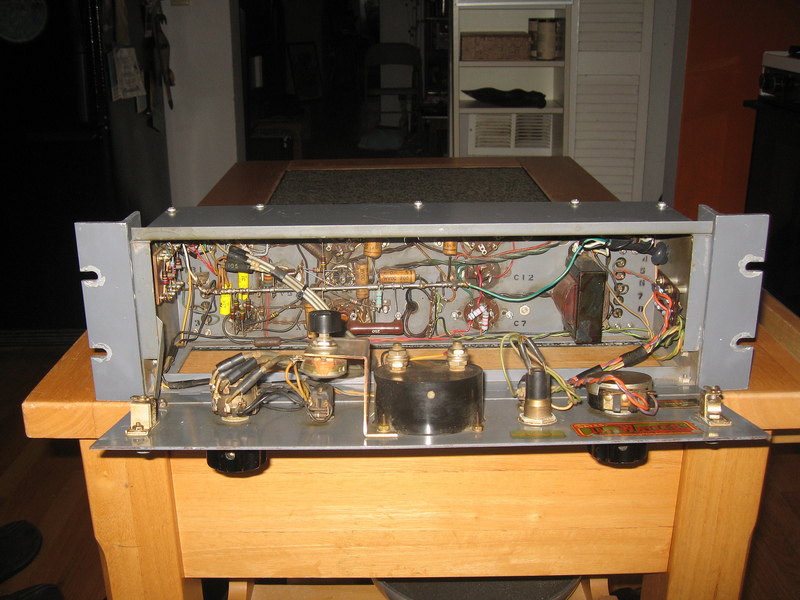 Obviously the original enclosure has not enough depth to fit an PCB, so I am looking for a reissue with an authentic hinged faceplate; like Bernd's. Did you use the 6386 or the 6BA6 in your build? 2x 6BA6. Performs quite nice. EDIT: now using 6386 tube. Needs some tweaking in order to work correctly. how much current going through input and output pots ? Nothing fancy here. Take standard pots which are commonly available. Got some original style hinged cases coming soon, I'll put some pics up as soon as I get them back from the Manufacturer. All depend on the depth of your case. Since this project is pcb based it won't fit in cases made to the original sizes. If your cases are at least 18cm deep, you are our man. Looking forward to see some pictures. just a quick one. Meter Simpson Model 27 200mA AC? Not DC and not Voltage, right!? You'll need a DC meter. I do not really remember how much mA the meter I use has got. 200mA should do. Edit: a standard VU meter works fine as well, although meter movement doesn't reflect the faster attack/release values as nice as a DC meter. I'll have a look on evil bay. I'm happy not decided to go for a stereo build. The original unit uses a 200uA (micro) meter. I have tried to use a 1mA in my Drip Sta Level built, but It's not possible to adjust it correctly. Glad to see your new project. It seems to be an amazing project for the vintage lovers. How it sound with your wima and nichiden caps ? I used Vishey (?) caps. Well , the units sounds really great. The thing I love most is that you can't hear any compression (artefacts) at all. You wouldn't believe that it compresses until you watch the meter and look at the waveform. The huge amount of gain is just insane. Today I plugged in a tube mic directly into the compressor. Just crazy. I had a chance to play some hours with on a Sta Level few years ago. .I'm curious to hear the demo samples of your clone on drums ,bass ,vocal. Just to be sure, we talk about a build in the 1k-1k5 € range ? It depends very much on the transformers you are going to use. Tube projects are alway more expensive than solid state projects. I didn't really take care about costs, but my impression is that you can build it for less.